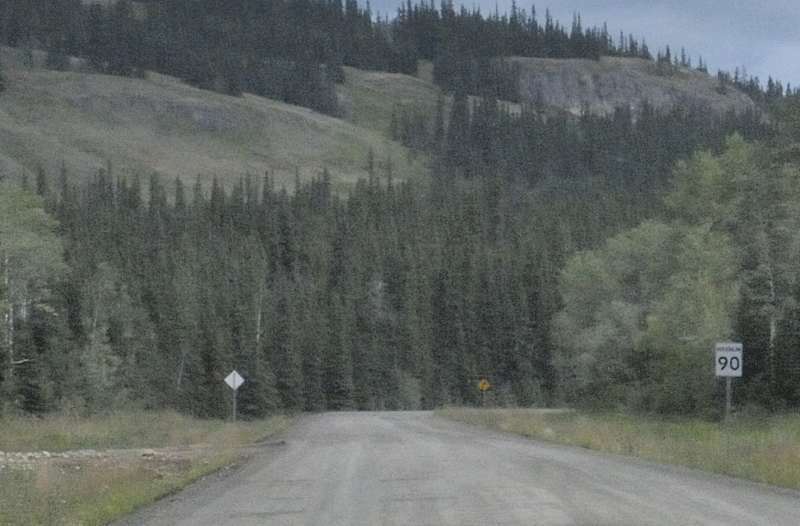 This is a belated report on my August 2012 trip on YT 6 (Canol Road), from the Alaska Highway to the Northwest Territories border. That was part of a two-and-a-half-month road trip, covering over 23,000 miles including many of the bad roads of the Arctic. 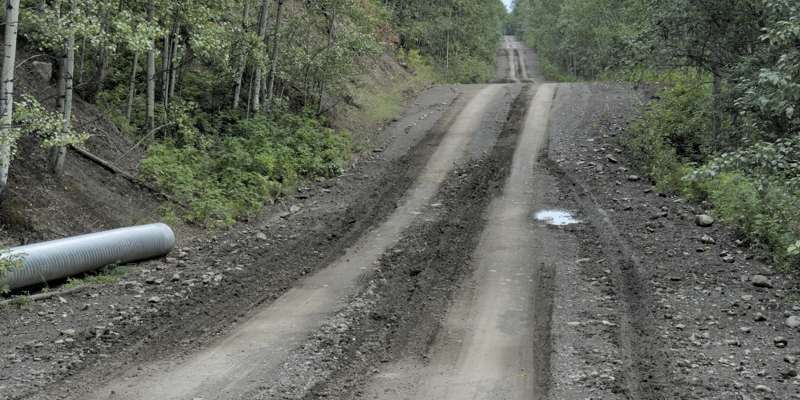 Canol Road is high on the "bad roads" list. Canol Road's south end is at the Alaska Highway (YT 1), southeast of Whitehorse. It originally ended near Norman Wells NT. Some of its history is recounted in the trip report of my visit there last August. 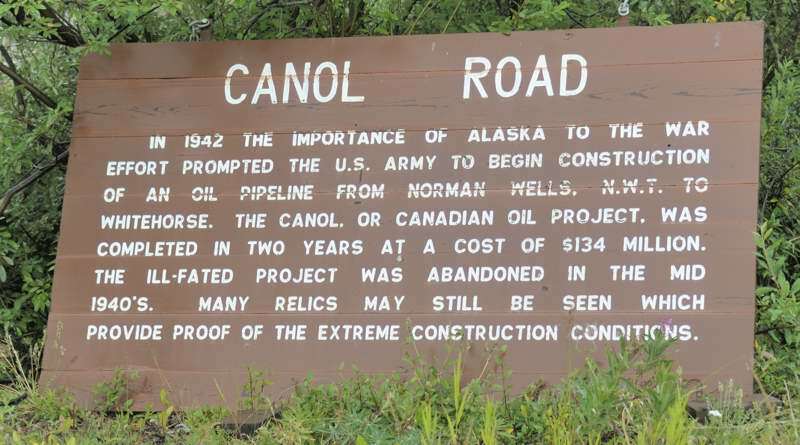 The Canol Road fell into disuse after the associated oil pipeline was shut down as World War II was winding down. 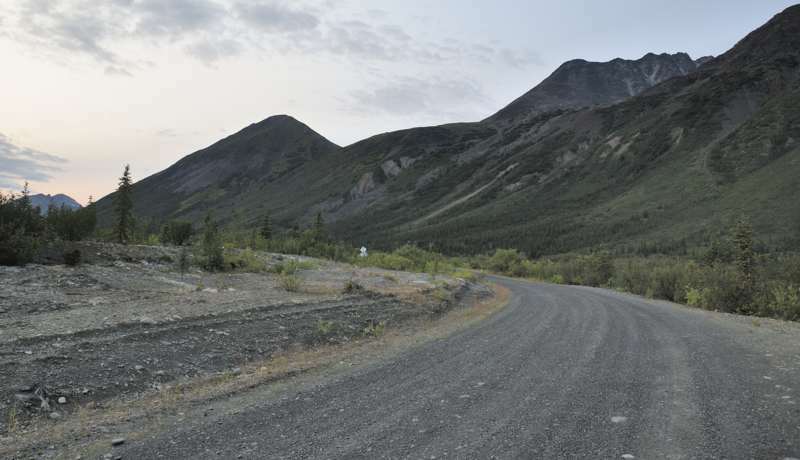 Yukon Territory reopened its part of Canol Road for recreational and mining access. 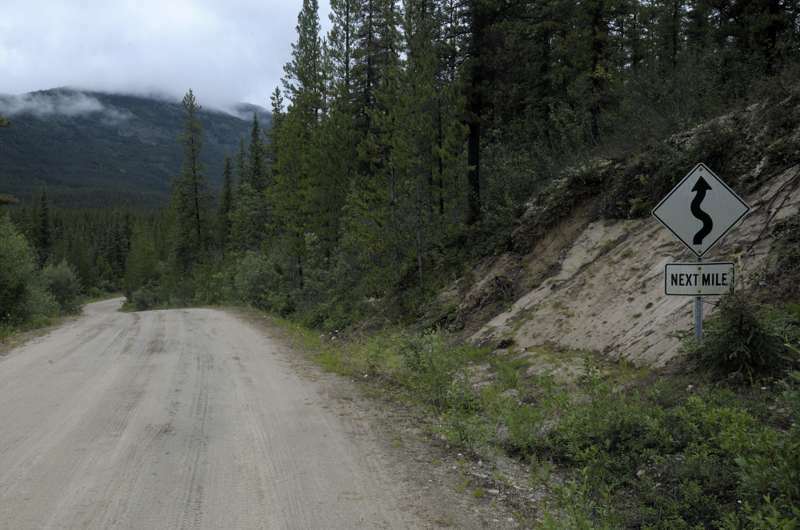 Most of the Northwest Territories segment is impassable for motor vehicles, but remains in use as the long and challenging Canol Heritage Trail. Canol Road is one of the most difficult highways I've ever driven. It is narrow, about 450 km long, and open only in the summer months except for a short multiplex with and spur from the Campbell Highway (YT 4) to the village of Ross River. The road is entirely unpaved, and most of it doesn't get a lot of maintenance. Except for the Campbell Highway segment and Ross River spur, it has a 60 km/h speed limit, not that the constant washboarding and potholes will let you comfortably travel that fast. I was able to drive the highway in my old 4x4 pickup truck. But the few other vehicles I saw on the highway (its seasonally-adjusted ADT is in the low dozens) included no conventional passenger vehicles, which I think the road would quickly chew up and spit out. 4x4 is unnecessary except when the road is wet and slippery (better to wait for the road to dry out), and high clearance is nice but optional, but a beefy suspension and light truck-rated tires are a must. While the travel guides don't urge you to bring more than one mounted full-size spare, I suggest a second if at all possible, in case a deep pothole, on a stretch that hasn't been recently graded, bends one or two of your wheel rims. 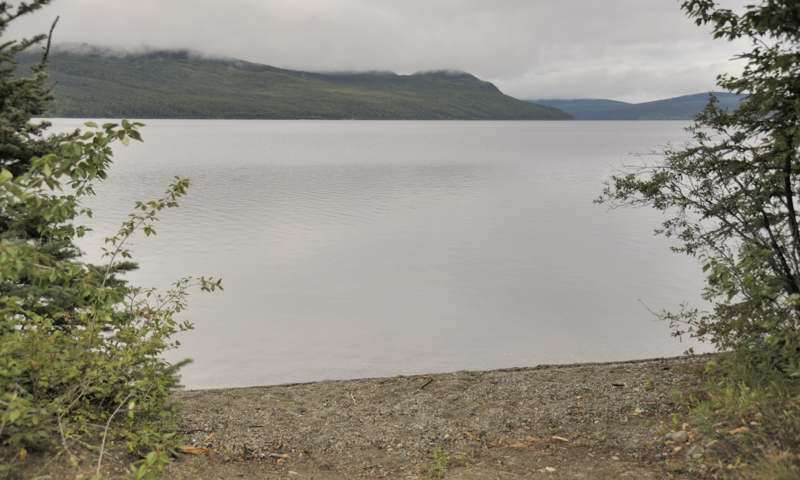 There are no services, other than unattended campgrounds, anywhere along the route except near its beginning at the Alaska Highway, and in Ross River. Except in that village, nobody lives along the route, though there are some summer cabins along the way. You can also forget about cellphone coverage. While some highway maintenance stations along the way supposedly have emergency satellite phones, it would be a good idea to bring your own (for less isolated and better-traveled Arctic highways, like Alaska's Dalton Highway or the Dempster in Canada, a CB radio will do). North of Ross River, it's a ~465 km round trip to the NT border, so you need to bring enough fuel to get to the border and back, mindful that the rough unpaved surface and mountain grades will be unkind to your gas mileage. In Ross River, I filled up my ~100-liter gas tank, and two 25-liter plastic gas containers. I doubt I would have made it to the border, and back to Ross River, without at least one of those containers. My Canol Rd. trip was done in three days. On day 1, I covered what is often called the "South Canol Road" from the Alaska Highway to Ross River. Day 2, from Ross River I took a ferry across the river to the "North Canol Road" segment of YT 6, then to the Northwest Territories border to complete my coverage of YT 6. Day 3 was the return to Ross River, from where continued my road trip east on YT 4 to Watson Lake. ^ The south end of YT 6, at its junction with the Alaska Highway (YT 1). ^ Information panel near the Alaska Highway junction. 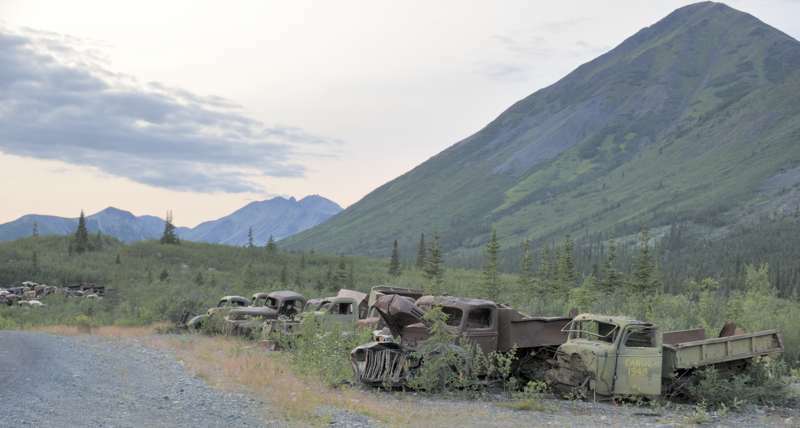 On the other side of YT 6 are remnants of a few of the vehicles used for Canol Rd. construction. ^ ^ Road signs on YT 6 northbound after the information panel, with small and blurry enlargements (from the same "negative" as the larger photo) of the warning signs. 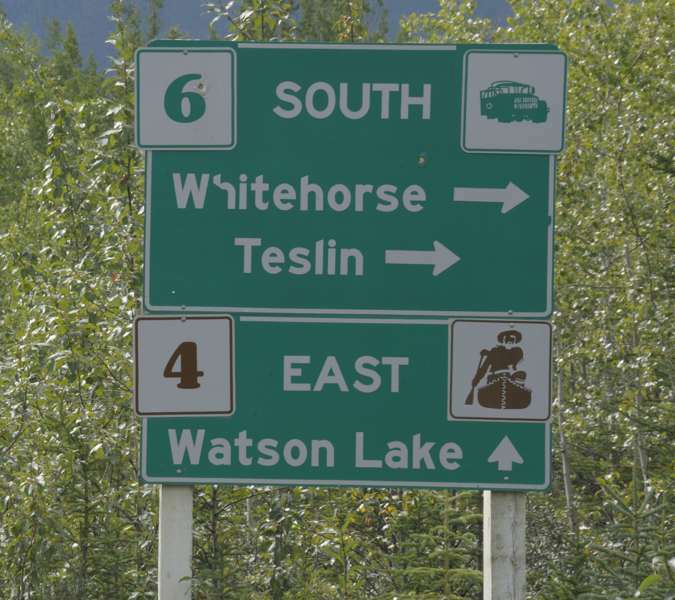 Yukon Territory usually includes the route number and icon (for YT 6, a construction vehicle) on distance markers, which helps makes route number signage more common than in rural Alaska and the Northwest Territories. ^ ^ Quiet Lake, a large lake near km 90, has government campgrounds at both ends, as well as a highway maintenance station. 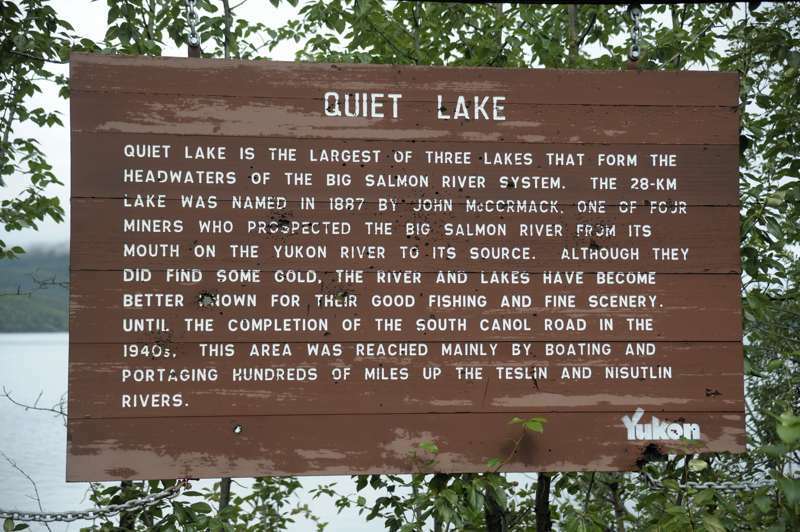 ^ This is one of several similar signs using the pre-metric "1 Mile", between km 132 and km 138 north of Quiet Lake. Non-metric units of measure are rare in the Yukon, on both official road signs and billboards, but not quite as rare as elsewhere in Canada. ^ One of the Rose River crossings, probably #2 near km 138.5. This is one of the river crossings where a one-lane bridge was replaced by culverts. ^ ^ Lapie River bridge #2 at km 210.2, and a view of the Lapie River canyon south from the bridge. 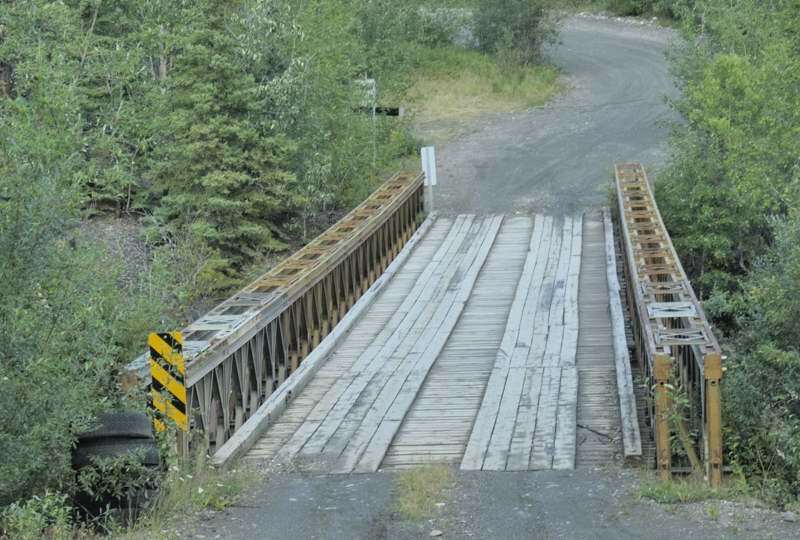 This Bailey bridge is one-lane and wood-decked (as usual for bridges on Canol Rd., though the shorter bridges don't have the steel side panels typical of Bailey bridges). But it offers brief relief from the constant pounding from the washboard and potholes, so a bridge of any kind is something to look forward to. ^ YT 6 multiplexes with YT 4, starting at this junction (viewed eastbound) at YT 6 km 220.1. ^ The YT 6-YT 4 multiplex ends here (viewed here from YT 4 eastbound), about 7.8 km west of the eastern junction. The multiplex once was only 0.2 km long, when YT 6 followed a now-unmaintained old Canol Rd. alignment, until YT 6 was moved to the Ross River Access Rd. (former unsigned YT 173). The new alignment is longer, but also much wider, smoother, and faster than the old alignment. ^ ^ The Ross River Access Rd. segment of YT 6 looks nothing like the original Canol Rd., especially the 90 km/h speed limit (highest limit allowed anywhere in the Yukon Territory). ^ In Ross River, the Pelly Barge takes auto and pedestrian traffic across the Pelly River to the North Canol Road continuation of YT 6. The barge carries one or two vehicles at a time, free and on demand, eight hours each day in the summer. It doesn't run when YT 6 across the river is closed for the winter. Pedestrians also can take the walkway on the suspension bridge in the background (it was closed for safety reasons when I visited Ross River in 2012, but reopened last year) to recreational facilities and the former Ross River townsite on the river's north shore. The bridge also carried the Canol oil pipeline over the river, until the pipeline was decommissioned. 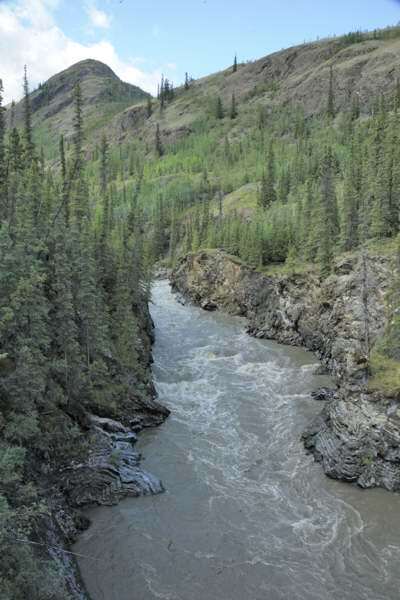 ^ The North Canol Road narrows and hugs the Ross River, north of the Pelly Barge and the confluence of the Pelly and Ross rivers. This view is of the southbound highway, approaching the ferry crossing. ^ Soon after the highway peels away from the Ross River, it narrows even more, to one-lane with pullouts. This also shows the potholes and washboard that make the drive toward the Northwest Territories border so unpleasant. ^ The highway passes by several lakes. I don't know which one this is, but it's probably south of km 280 (about 55 km north of Ross River). ^ This prominent peak might be Mt. Sheldon, near km 350. ^ This is the first of several graveyards for equipment used to build the Canol Road and parallel oil pipeline, probably near km 381. No scavenging allowed here or any of the others -- these are legally protected historic relics. 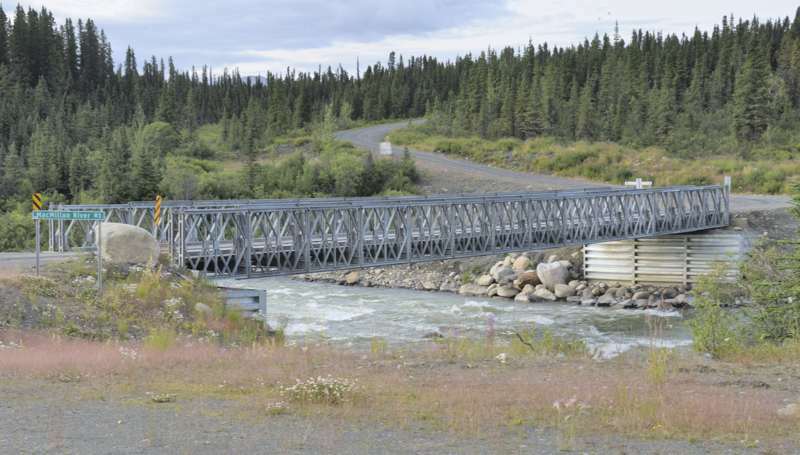 ^ The long Macmillan River bridge #1, at km 412.9, is the first of a half-dozen one-lane Bailey bridges across the river as it zigzags down from Macmillan Pass. ^ This is the final distance sign/route marker approaching the Yukon/Northwest Territories border, at the Dewhurst Creek one-lane bridge at km 428.7. ^ ^ Two scenic views of the road entering the Macmillan Pass area, with the Selwyn Mountains on the east side of YT 6. ^ ^ This probably is the last equipment graveyard before the border, near km 437. In the closeup photo of one of the vehicles, I'm not sure "1948" is a date, or just a random vehicle number. Construction on the road and pipeline was done before World War II ended, but the U.S. Army reportedly came back here in 1948 to salvage some of the abandoned pipeline and other equipment it left behind. ^ YT 6 ends here at the border, at km 462.7. 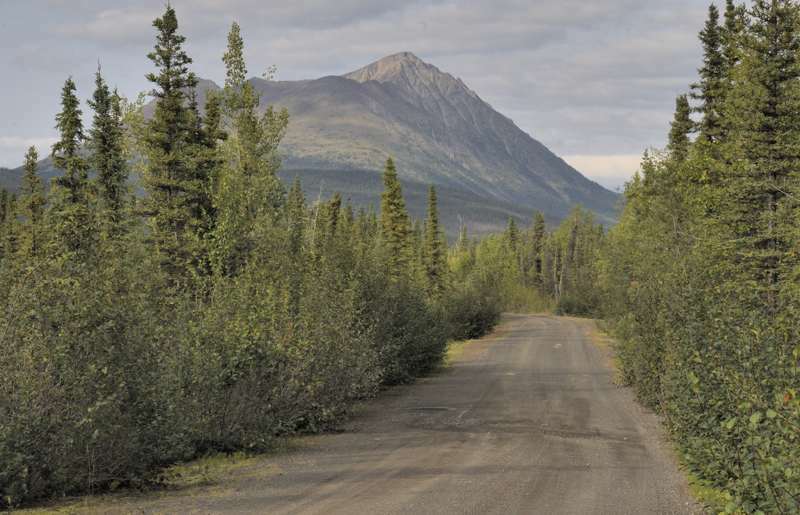 Canol Road continues briefly past the border, to a wildlife check station used by hunters. Beyond that point, the road becomes impassable to motor vehicles, and turns into a long and difficult hiking trail the rest of the way to Norman Wells NT. I turned around soon after crossing the border, since it was almost sunset, and the road looked like it was in even worse condition and got even less maintenance than the minimal maintenance in the Yukon. So I crossed back into the Yukon and pulled off the road for the night. I wish I'd returned to the border to try to cover the traversable part of the road in the Northwest Territories, but instead turned south to catch the ferry back to Ross River village, refuel, and resume my long trip back home. Great write-up and photos for what must have been an arduous journey! Absolutely stunning. It must be exciting and a little scary to be in this wilderness. As always, awesome. Thanks for sharing oscar. And for anyone curious to see even more, a good chunk of the Canol Road is available on Google Street View, much to my surprise. If AA was an app, there would be a paywall on this page; premium content. I was surprised too, but was able to use what there was of GMSV to double-check some notes in my post. My guess is that the GMSV camera car turned back because it didn't have enough fuel to get to the border and back; or had trouble with the wet road (the driver disregarded official advice not to travel the road during or soon after rain); or the driver just chickened out.